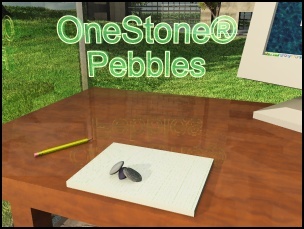 Welcome to the OneStone® Pebbles Home Page! OneStone Pebbles are a series of calculus visualization tools developed by Bright Ideas Software®. Designed from the ground up with input from education professionals1, these unique tools meld current educational theory2 with state of the art graphics technology in consistent, easy-to-use packages. Each 'Pebble' in the series is a stand-alone program designed to illustrate a specific topic in the calculus syllabus. The complete list of Pebbles currently available can be found on the Pebbles Version History page. The user is given control of the experience. This is achieved at several levels; for instance, rather than displaying illustrations/animations of pre-defined functions, Pebbles display representations of arbitrary user-defined expressions. High quality graphics are used to depict the user-defined expression. To be fully effective as an illustration of a dynamic system, and to truly trigger deeper insight into a given covariant relationship, the graphics technology employed must be capable of smooth animation and realistic enough so as not to distract the eye, and mind, from the mathematical relationship being illustrated. Realistic lighting and shading effects are essential to this goal, exploiting innate human capabilities to gather information visually. Information is simultaneously presented in multiple formats. Adding a three dimensional display teases minds with possibilities beyond normal expectations, even with topics historically treated exclusively with two dimensional visualizations. A minimalist User Interface (UI) design is employed, with as much reuse as possible between modules. Pebbles are designed to be used primarily as educational tools. Paramount importance is placed on ease of use and simplicity of design, while maintaining high-fidelity graphical output. Any student familiar with graphing calculators will be able to make immediate use of Pebbles programs. Written in Java and exploiting Oracle Corporation's Java OpenGL technology, OneStone Pebbles will run on Apple OS X, Microsoft Windows Vista or above, Solaris and many common configurations of Linux. They do require the installation of the appropriate Java run-time on each client machine, available (again, free of charge) from www.Java.com (or by clicking on the Java icon at left). It is also recommended that you ensure each client machine has the most recent available video drivers installed. Full installation instructions and hardware requirements can be found on the Installing Pebbles page. As mentioned above, the UIs of the various Pebbles are largely identical. The behaviors common to most Pebbles is described on the Using Pebbles page; any instructions particular to a given module are included on that module's web page. Each Pebble download also includes a Help file containing the relevant information from these web pages. 1 Bright Ideas Software wishes to thank the following members of the University of Wyoming faculty for their support: Dr. Jerry Carl Hamann, Computer Science Dept; Dr. Alan Dale Moore, College of Education and Dr. Bryan Shader, Dept. of Mathematics. 2 See (e.g.) 'Applying Covariational Reasoning While Modeling Dynamic Events: A Framework and a Study' by Carlson, Jacobs, Coe, Larsen and Hsu.